Martins Susters scored a brace in both games against Sheffield. 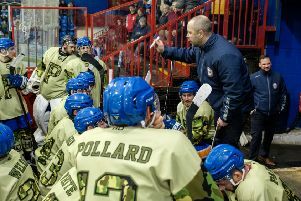 Phantoms coach Slava Koulikov has issued his players with new year praise - but insists further improvement can still be unlocked. The city side have defied the doubters to climb into third spot in the English Premier League during a campaign packed full of promise. It’s a position they cemented with a pair of high-scoring victories against Sheffield Steeldogs to launch 2017. Phantoms thumped their depleted visitors 10-2 last Sunday before following up with a 6-1 success in Yorkshire the following night. And while Koulikov is mightily impressed by what his men have already achieved, he has set no targets for the remainder of a campaign which features a tilt at EPL Cup and play-off honours. Koulikov said: “I told the guys on New Year’s Day that they have done a great job so far and already proved a lot of people wrong. “It has been excellent to see the way we have grown as a team since we first stepped onto the ice with so many new faces. “We’re now more than halfway through the season and we have some big teams such as Guildford, Swindon and Basingstoke below us in the table. That is an excellent achievement in itself. “We’re doing extremely well, but we can still be better. The way to do that is to continue working hard and trying to perform for a full 60 minutes in every game. “They are the only goals we set ourselves - there are no targets in terms of finishing position. The guys do not need that kind of pressure. Koulikov describes the EPL Cup as Phantoms’ ‘quickest route’ to a trophy. They were beaten in the final of the knockout competition by Guildford last season. They have again advanced to the latter stages and face Telford in a semi-final showdown which is understood to be provisionally scheduled for later this month. Neither club has confirmed dates as yet.